Fuel pump size? 351 carbed. Well i am going carbed. I bought a ford motorsport 385hp 351W crate engine for a great price. 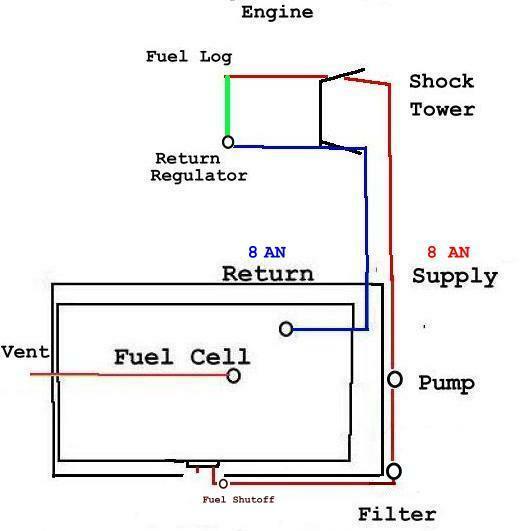 Now i am trying to figure out how much fuel pump i'm going to need. 750 proform carb and Tick Flow track heat heads. I will be squirting a 125-150 shot thru this as well, which brings another question, should i use a seperate fuel pump for the nitrous? Any ways, i have been into fuel injection for so long, i'm not used to this carb stuff anymore. With luck these parts will give me at least 350rwhp." without nitrous"
RE: Fuel pump size? 351 carbed. I am using the Holley Black pump and a return regulator. I would rather over build the fuel system, and never have to redo it, than have to keep upgrading it as my power level goes up. I would use 1/2" for the entire system for the gas and 3/8" for the 'other' side. Using regulators there should be no problems. I'd set the carb gas @ 5-6. Hey tinman. Why the use of relays on the pumps instead of just key on? By the way, i'm going to be using my stock tank and i'm going to be welding in a sump. This helps guys, but how do you calculate how much fuel you really need so you can buy the correct pump? I will be seperating fuel pumps for the engine and nitrous, to be on the safe side. Reason for the relays is so that when pumps start, they running on the full 12.5-13.5 volts. Makes them have a better reliability. If I can remember right it takes 5# of fuel per HP per hour. So you can see if you have a carbed car a pump of say 140 gallons/hour will work good. The gas tank i'm not worried about. I am going to purge this tank before i weld it. I have done it many times before with making my own rear sump kit. I am thinking about getting the summit kit SUM-PUMPKIT7A which includes a 110gph pump. Quick Reply: Fuel pump size? 351 carbed.